Remington has been producing ammunition since 1871, and continues to produce their products here in the United States. Offering anything from range ammo to ammunition for self defense and everything in between. 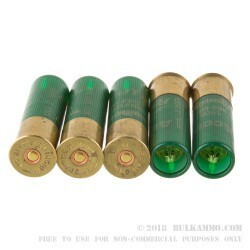 You can't go wrong with choosing these Remington slugs for your hunting needs. 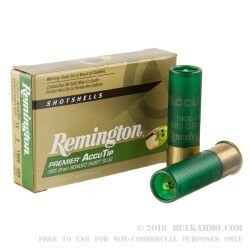 5 Rounds of 12ga 3' Ammo by Remington 385gr Sabot Slug is perfect for your rifles shotgun barrel when hunting for whitetail deer or other larger game. 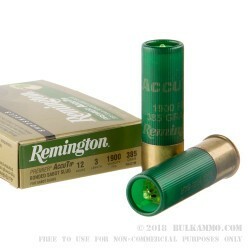 This is loaded with Remington's AccuTip Bonded Sabot Slug with Power Port Tip. It has a muzzle velocity of 1900 feet per second and generates 3086 foot pounds of energy. Once it reaches out to 50 yards it is still traveling at 1656 feet per second and has 2344 foot pounds of energy, which is more than enough to sufficiently take down your target. If you are interested in an even longer shot, this shell is capable of 1439 feet per second and 1771 foot pounds of energy out at 100 yards. The bonded projectile helps it to hold together and not come apart when it enters its target with that huge amount of energy and speed. This will deliver maximum damage and make finding the projectile that much easier.